Sightpath shares the knowledge and expertise gained from assisting in more than 75,000 laser cataract procedures. Sightpath provides all of the equipment and support needed for a successful surgery day. Our comprehensive suite includes the LenSx laser, surgical supplies, manufacturer engineer, clinical support, implementation resources and access to customizable practice marketing tools. With the MoFe option, there is nothing stopping you from offering laser cataract surgery at your facility. 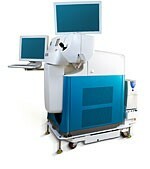 MoFe customers may choose to add Sightpath’s traditional cataract service, which includes advanced equipment. We offer next-generation phacoemulsification systems including the Alcon Centurion, Johnson & Johnson Vision Signature and Bausch&Lomb Stellaris. Also, YAG lasers from Ellex and Nidek are available to help you provide superior patient outcomes. With our traditional cataract service, Sightpath offers access to a Phaco device, board-certified CST, and all of the instruments, IOLs and supplies needed, including a backup Phaco system, to ensure a successful, productive surgery day. 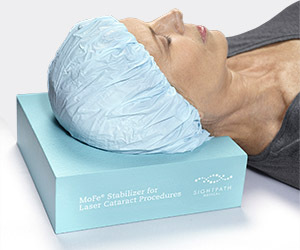 The MoFe Stabilizer is Sightpath’s unique device designed for optimal patient head positioning. Not only can it help reduce movement, thus increasing the likelihood of a free-floating capsulotomy, the MoFe Stabilizer also elevates the neck to create an even plane for effective laser docking. Drs Patterson & Bregman, both from TN, share their impressions about adding the femtosecond laser for cataract surgery into their practices. Before becoming a customer, a site survey must be completed for all mobile Femtosecond Laser for Cataract Surgery customers. See what that entails. Dr. Larry Patterson discusses his MoFe implementation process and the benefits of working with the market leader. Dr. Bregman with Eye Health Partners in Nashville, explains how partnering with Sightpath has made offering Laser-Assisted Cataract Surgery a reality for his practice. Dr. Richens with Richens Eye Center in St. George, explains how partnering with Sightpath has made offering consistent Laser-Assisted Cataract Surgery in rural areas a possibility for her practice. Watch our engineer install, calibrate, utilize and remove the laser through the use of our patented transport system. Follow our Engineer through a typical MoFe case day and hear from OR staff how the Sightpath team supports her staff. Drs. Patterson and Bregman share their thoughts on adding femtosecond technology to their practice by partnering with Sightpath. In part II of our series, hear how the team at Dillman Eye Care Associates has incorporated the new technology into their practice. Dr. David Dillman and Dr. Andrew Dvorak of Dillman Eye Care Associates discuss the benefits of Sightpath Medical’s MoFe program after one year of using the service.